Improving your basketball skills depends on your own wall to become better. It takes determination and patience in order to become a better player. As you learn how to improve your basketball skills, you should possess the following mindset and attitude in order to be successful at it. First of all, you need focus if you ever want to improve your basketball skills. The ability to concentrate on becoming better with the type of basketball skill that you are working on is very important. As you go on with the process of learning how to improve your basketball skills, your focus will dictate how quickly you may be able to see the results of your efforts. However, a highly-skilled coach plays a key role to improve your game. 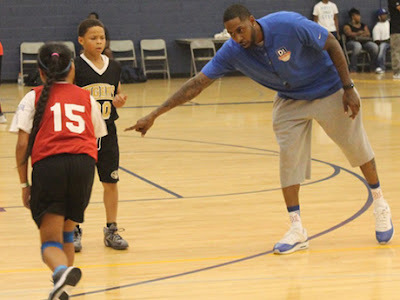 If you are looking for Basketball Coaches St Louis, then Larry Hughes Basketball Academy is perfect for you. Like we said, a player needs to be focused, and also need the burning desire to succeed as a more capable athlete. Hard work alone won’t get you far if you don’t have the passion for doing what you love. You will learn that if you have the desire to get better at basketball, it will be easier for you to make improvements on your basketball skills. Having a positive attitude is also an important trait to have as you try to get better with your basketball skills. The positive attitude can affect not only as you try to improve the skills of the game. It can also affect the people around you such as your teammates. Having a positive attitude can help you have enough to get going even if the going gets tough. So if you feel like nothing is going right, positive attitude will help you feel that you still can. Step 1: First, make yourself open and create a lead before you receive the ball. When you get the ball set up the shot you want and go for it. Remember Hoped shots never get in the basket so have confidence. Step 2: Shot selection, always practice your best shots to make them perfect and you will become a very good shooter. Only good practice makes a good shooter very rarely will someone be good without having any practice. Pretty easy to understand, also know where your teammate never shoots if your teammate is in a better position. Finally, beware of defensive players ready to intercept the ball. Step 3: Shoot with consistency. Always be in balance. Take off is with opposite foot of the shooting hand. Hold ball high with wrist back and elbow pointing directly at the basket. Release ball quickly, but do not hurry as it could result in a miss. The ball should mostly have good backspin. Remember to always follow through. Keep shooting hand and fingers extended until the ball goes through the basket. Enjoy your shoot. Step 4: Concentrate on the shot all the time, don't take your eyes off the basket rim. Always remember if you lose focus the shot is blown. When shooting you should only have one thought in your mind on every game and match and it's and that's the shot you are going to make. I would like to finish by saying to really get better basketball skills you need to learn how to jump better and get the more powerful burst of energy to improve your game.